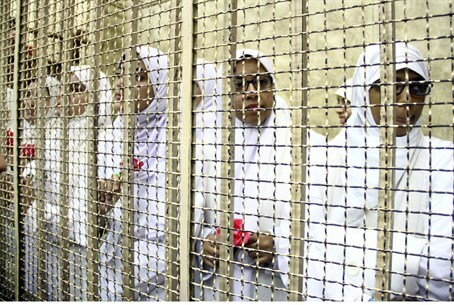 Courts in Egypt order the release Saturday of 21 women and girls jailed over an Islamist opposition protest. Egyptian appeals courts ordered on Saturday the release of 21 women and girls jailed over an Islamist opposition protest, after reducing harsh sentences that had sparked outrage, reported AFP. The 14 women - initially jailed for 11 years - were ordered freed after receiving one-year suspended sentences from the court in Alexandria. The girls, whose case was heard in a separate court, were put on three months' probation after having initially been sentenced to juvenile detention. The initial sentences shocked even supporters of the military-installed government when they were handed down last month, according to AFP. The women and girls were all released by nightfall, one of their lawyers said. All 21 were convicted of taking part in a violent protest demanding Islamist president Mohammed Morsi's reinstatement following his overthrow by the army in July. They were initially found guilty of multiple charges, including belonging to a terrorist group, obstructing traffic, sabotage and using force at a protest. Judge Sharif Hafiz found the 14 women guilty of three counts relating to violence during the protest, but reduced their sentence to one year and suspended it. Their lawyer Ahmed al-Hamrawy had urged the court to acquit them, arguing there was no evidence against them. He later welcomed the new sentences but said he would appeal them anyway to get acquittals for the defendants. "The sentence is satisfying to a degree, and it has a humanitarian aspect... but we will appeal," Hamrawy told AFP. The jail sentences were handed down just days after Egypt’s interim government signed a new law that severely limits the right to protest and requiring protests to receive permits from police. The new law was met with anger by protesters who took to the streets in defiance of the new orders. More than 1,000 people, mainly Morsi supporters, have been killed since July 3 when he was ousted and authorities have rounded up some 2,000 Islamists, including most of the leadership of the Muslim Brotherhood, of which Morsi is a member. The Egyptian government just recently lifted a state of emergency that was declared on August 14, the day of the crackdown on the protesters. Last week, the country’s new draft constitution was approved for a referendum. The revised charter preserves the military’s wide-ranging powers, including the ability to try civilians in certain cases. This has angered secular groups that backed the military in ousting Morsi. Egypt's Muslim Brotherhood was quick to reject the new constitution. Pro-Brotherhood demonstrators protested angrily in Cairo's Tahrir Square, shouting "the people want the fall of the regime" - the slogan of popular protest movements which sprung up during 2011 at the start of the so-called "Arab Spring".